Growing schools need extra space and modular classrooms can be a good solution. With budget deadlines on the horizon, ensuring that money is being invested in the best possible way is a priority for many schools. Those that don’t use it will lose it, so finding an interesting project to spend their money on is top of the to-do list. More and more schools are choosing their next investment to be one that encourages outdoor learning and a new and inspiring classroom is the most popular option. One of the biggest decisions to make, however, is what type of new classroom to choose. When trying to find the best financial deal, are modular classrooms or more permanent buildings the most beneficial in the short term and long term? When choosing a modular classroom, many schools decide to hire rather than buy. While the initial cost of this may be more within the school’s price range, it is not always a sound long-term investment. Rented portable classrooms may not add as much value to the school grounds and will eat away at the school budget for as many years as they are there. 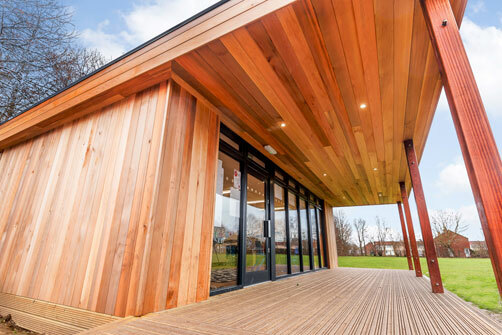 Other types, like timber frames buildings, can be designed to blend with the rest of the school and will contribute towards an inspiring learning environment. The initial investment may be more expensive but the long-term gains are higher. Many modular buildings are put together offsite. This may save some time as less construction needs to take place on the school grounds but this can cause costly delays further down the line if unexpected problems arise. A modular eco-classroom can be part constructed off site and can adapt to work round issues as and when they come about. The buildings can also be modified in the future as more space is needed. The diagram below demonstrates the difference between a traditional classroom construction and the time saving benefit of a modular classroom build. What makes a perfect classroom? Funding is available for many school building projects but if a school opts for a build that will benefit them for the long-term future, particularly if the supplier has an environmentally-friendly focus, there may be more financial options on hand. In the circumstances of an emergency, a rented portable classroom may be the only option but schools that are looking to make an investment that will benefit them in the long-term will often find that a timber framed eco-classroom is the best financial decision. Not only can they be built completely bespoke to your school, no matter what obstacles that arise in the process, they may be eligible for more funding. If your school is thinking about investing in additional classroom space, ensure that you are getting the full service. Our Learning Escapes can cost from as little as £1,200 per square metre and start from only £48,000. Below are two examples of the wide ranging classrooms and buildings you can have with a Learning Escape school building. For more information about our builds and to get a free survey, contacts us online or call us on 0800 917 7726. To see our full of modular classrooms and buildings see our range and prices or you can also check out our case studies.